Do your drums have adequate secondary containment? Look over Andax's Spill Decks and Drum Top Covers for the right storage and containment product for you. Dispensing from drums is messy! But not when you use our new and improved Drum Top Covers. Choose from our grime-hiding Universal grey or our Oil-selective white. Each cover is die-cut to fit perfectly around the vent and bung fittings on standard 55-gallon drums. These great sorbent covers will help you keep your work place cleaner and safer. 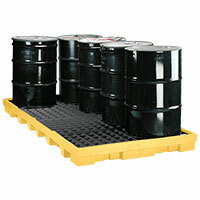 Achieve secondary containment compliance for indoor drum or tank storage with a Spill Deck. Available in two-drum, four-drum, six-drum and eight-drum capacities, all feature high-visibility yellow sidewalls and each unit has a large liquid containment capacity.